Fred Black, from Out of Town 4WD near Newcastle, originally built this Troopy to carry tourists on Stockton Beach and surrounds. They used 2 Troopies and a roof from a third wagon to create this wagon. The job was done over 20 years ago and to their credit, hasn’t deteriorated much in the body work. When Damien dropped his Troopy into Ian Oak at Brookvale Opposite Lock, he called over a mate who owed a Troopy to ensure mounting points were as per original so they could fit a rear wheel carrier. The fella that came over just happened to be the apprentice all those years ago that helped build it. 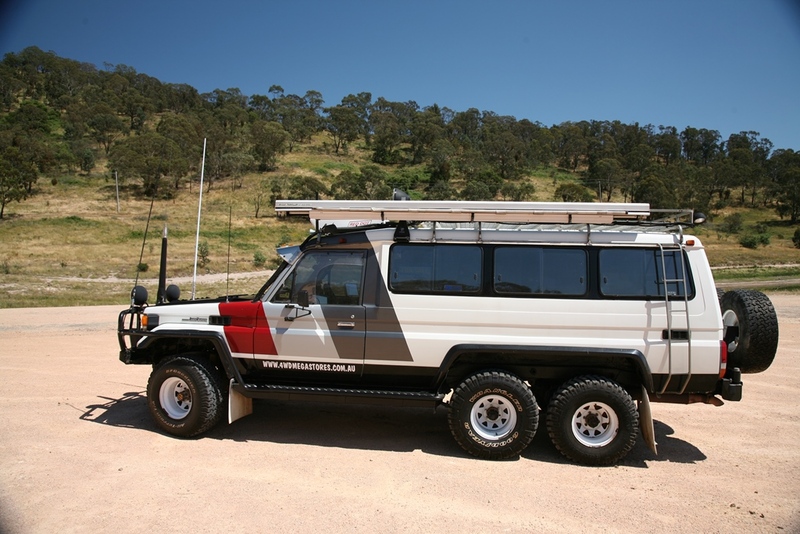 Fred built 3 of these Troopies before swapping over to OKAs and 4WD buses. While Damien was travelling through Birdsville, he spotted one of the other extended Troopies that had just been retired as a tour vehicle - albeit in a pretty sad state of disrepair. Does anyone know the whereabouts of extended Troopy number 3 – let us know if you do? Yes, the standard mighty Troop Carrier is a pretty damn good touring option and most people are content with the overall size they offer to store a touring couples luggage, to sleep in the rear and with the originals engines performance. Every now and then you get someone that just isn’t happy with the norm and has to go tinkering with a tried and proven product – we are an ingenious lot when let loose with an angle grinder and welder! While Damien Smith, the current owner of this extra-huge Troopy, didn’t convert this truck, he did spend a lot of time to change it into his ideal touring vehicle. When he spotted it for sale after initially being used as tour company vehicle, then as a Truckies second home-away-from home, he knew it would be the best compromise he could find for his 3 year extended holiday– even though it already had over 300,000km on the clock. Damien and his wife figured the camping setup (as fitted out by the second owner) in the rear was a little cramped, so removed the lot and started from scratch. The full length drawers offer enormous storage potential for all their tools, recovery gear and cloths. The bed, on top of those drawers, stays made-up and is easily reached from either the front or rear of the vehicle. Mounted behind the drivers seat is a 60 litre Evacool fridge, while underneath it are a pair of 100 amp hour deep cycle batteries and a battery charger. Opposite the fridge is an extra bucket seat, underneath which are a 12 volt air compressor and a few spare parts. The driver and passenger have LTSS Stratus suspension seats to keep them comfy and also within easy reach of all the radio and communications gear stored in the overhead console. A GME UHF radio, a GME AM radio, Codan HF radio, CD stacker, Magellan Explorist GPS, Poron reverse camera, plus a hand full of dials to keep track of the drive line. To allow long distance outback runs without refuelling, they have the standard 80 litre diesel tank, plus a 120 litre Long Ranger tank, plus the right hand side sill tank holds 50 litres of diesel. The left hand sill tank holds 50 litres of water, plus there is another 60 litre water tank mounted underneath, which inadvertently gets heated by the exhaust system – great for a warm shower, not-so-great for a cold drink of water. Up front is a steel TJM bull bar with an Ox 15,000 pound electric winch, a pair of Cibie Super Oscars and all the associated aerials for the 2 way radios. At the rear is an Opposite Lock dual wheel carrier that carries two 33-inch tyres. While we’re on tyres – there’s a bit of a mix of 2 BFG All Terrains on the front, 2 Goodyear Wrangles in the middle, 2 Mickey Thomson Claws on the rear and the 2 spares are BFG’s – one muddy and one all terrain…I guess you’ve got to buy them when they’re cheap with eight all up! All are 33x12.5R15 on steel 15x10 inch rims. Up top is an extra-long steel roof rack on which Damien fits large space cases for storage. To the side is a large roll-out awning, while over the front of the cab is a huge roof-mounted air-conditioning unit, a pair of LightForce XGT spotties and two air horns. Four wheels were never going to be enough to cater for the weight and length of this Troopy, so a Multidrive Technologies (MDT) 6-wheel drive conversion was installed – not a lazy axle mind you, it’s got all six wheels capable of driving and is rated to 5.5 tonne GVM. It’s a leaf spring system that has undersprung leaves as standard on the middle axle and oversprung leaves on the rear set, which allows for full articulation without interfering with each other. The front is a standard leaf spring Troopy and all packs have 4-inch raised leaves. Tough Dog shocks manage to control the truck and are similar to that found on the mining and military versions of this 6-wheel drive system. An extra 2 cylinders was also called on to haul the Troopy around the countryside: a 6.5 litre naturally aspirated diesel V8 Chev fitted by Brunswick Diesel in Western Australia was mated to the standard Toyota 5-speed (albeit with a heavy duty clutch) and Toyota transfer case. An alloy PWR radiator keeps the engine running cool, while a 3 inch flexible mild steel exhaust tunnels its way to the rear. Both the front and rear diffs have ARB AirLockers fitted, while the middle diff is open. Brakes are standard Toyota, although a PBR hydraulic hill holder was installed – press your foot on the foot brakes, activate the PBR unit and all six wheels are locked when you turn the engine off…better than relying on that standard handbrake with 5.5 tonne to run away on you! Although this mammoth 6-wheeled Troopy doesn’t offer the same comforts as a full-sized camper van or motorhome, it has allowed this couple to explore most parts of Australia in relative comfort and ease. Many times they have arrived at camp site while raining, simply jump over the seats into bed – no canvas, no pegs, no worries. Is it the perfect tourer? No says Damien, nothing ever is as you always trade off some things in preference to others. They wanted supreme travel ability mixed with more comfort and space over a standard Troopy to take them on their 3 year travels as well as the more recent long weekends with family and friends. Ultimately, they’d like to change the engine for a V8 Duramax diesel and Allison gearbox for a little extra grunt over the already huge 6.5 litre Chev, but everything else would stay as is. In the meantime, this Extra Large Troopy is resting while the couple take on a new business challenge in the Blue Mountains west of Sydney.